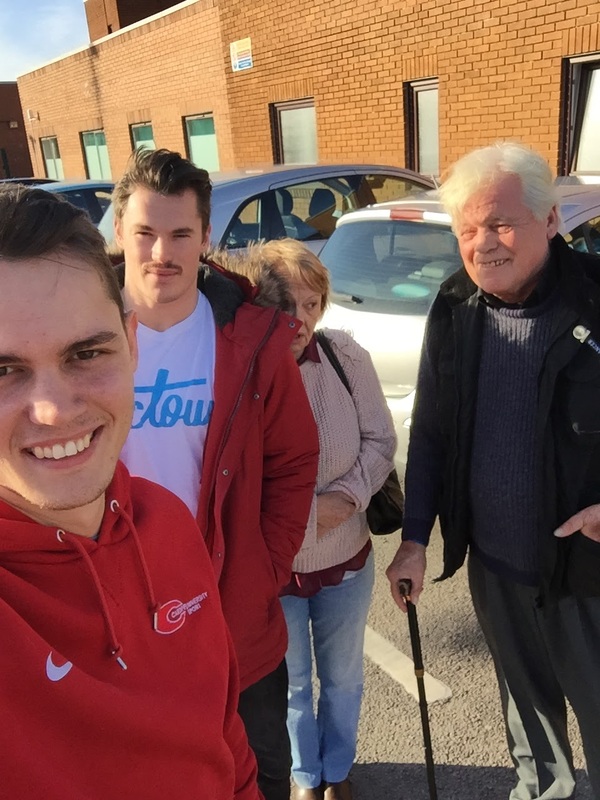 This weekend I was back in Velindre for the all important, and much anticipated, MRI results. Based on every other set of results I've had over the last eleven months I was all but resigned to more bad news but, as my mother and brother both wanted to come to this appointment with me and my father, I was hoping that I would be proved wrong. Before thinking too much about that however I had something else to deal with: My 25th Birthday. On Thursday I officially hit the half way point in my journey to my 50th Birthday Party, which those of you who have been reading the blog for a while will remember I declared I would be attending regardless of Timmy's best efforts. Not wanting to risk being hungover for Velindre early on the Friday I opted for a quiet family meal on the day, followed by drinks on the Saturday as it was pointed out to me that regardless of Friday's results I was highly likely to fancy a good drink by then. So, back to Thursday, we headed to Cardiff for food but had to change our plans slightly as it was also Beaujolais Day and as such our initial choice of restaurant was only serving a set menu. Thankfully TGI Friday is a solid safe bet and we managed to get a really nice meal in there without needed a booking. Another benefit was the fact that it is in St David's Centre, right by the Apple Store which gave me the opportunity to utilise the grant I had received off the Rob George Foundation specifically to buy an iPad. I opted for the Air 2, which will be handy for allowing me to blog while travelling without having to take my MacBook. Fed, watered and fully apple'd out we headed home to attempt to get some sleep before the trip back to Cardiff in the morning. Friday came and the four of us made that far too familiar journey to Velindre Cancer Centre, ready to discover what effect, if any, the 10 months of treatment had had on Timmy the Tumour. Upon arrival I had bloods taken as per usual and settled in the waiting room, relieved for a change to know that I wouldn't be going home with the collection of chemo tablets and sickness medicines that make up the worlds worst party bag. We were called through to the consultation room and discussed the usual wellbeing questions before getting down to business. "I'm going to start by telling you that it has shrunk". Words I wasn't expecting to hear at all. I'm not exactly sure what the next few sentences were because I was still focusing on that belter of a word: "shrunk". 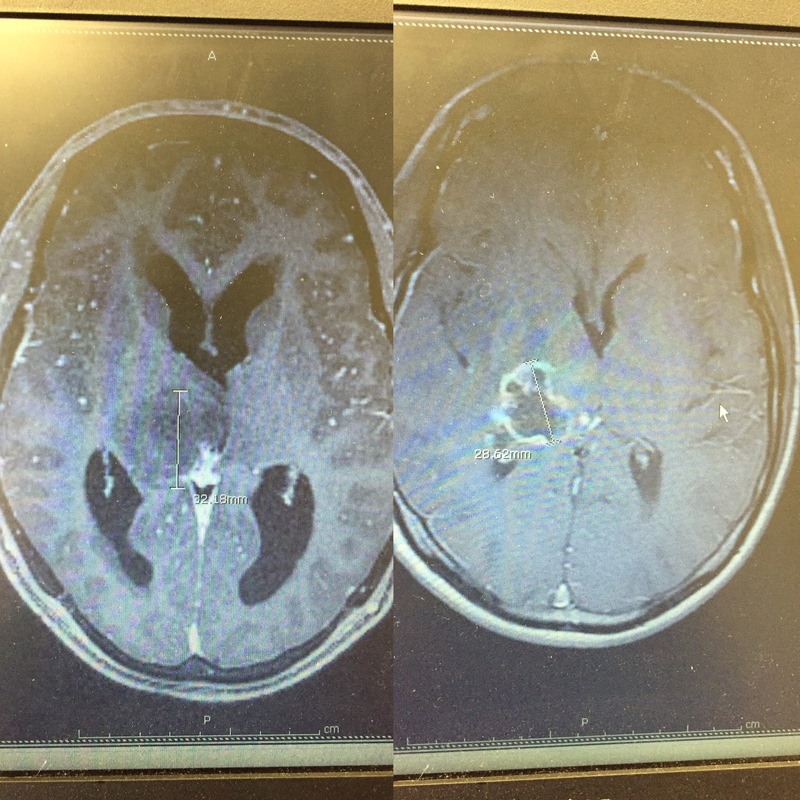 Suddenly all of that chemo didn't seem so bad, it had had its desired effect and reduced the mass of the tumour. The doctor then got my scans up for me to see and I found out that the tumour had shrunk from around 32mm to just under 29mm, a 10% shrinkage. 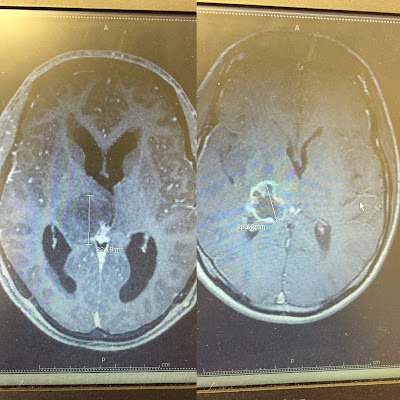 As you can see from the scans below, not only has the tumour (the dark grey bit with measurements next to it) shrunk, but the trapped fluid (the four black bits) has almost completely drained. After some time had been allowed for this news to settle in I was told that we would still require a few scans before any decision was made about ongoing treatment and the next scan will be before I embark on my travels, with the subsequent scan on my return. It is likely that the next treatment option will be chemotherapy in the form of an IV drip combined with tablets or a clinical trial if one should become available. Having absorbed as much information as I possibly could in that one appointment we left the hospital and in spite of myself I broke out into a massive smile. It's amazing how different I felt compared to the first appointment I had in that building all those months ago. I realised that it also presented me with an opportunity. I had declared on January 1st that my New Year's Resolution was going to be learning to smile in a photo, unfortunately I was diagnosed five days later which has meant minimal smiles ever since. As this smile seemed unlikely to move any time soon I took my chance and completed my resolution with a month to spare. Fantastic news! Well chuffed for you.